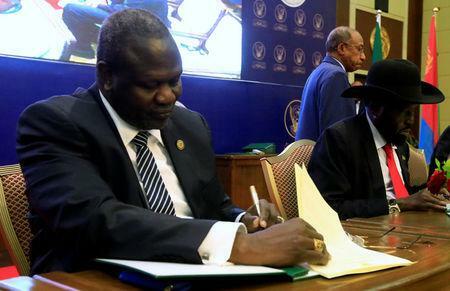 CAIRO (Reuters) - The president of South Sudan and head of the country's main rebel group signed a final cease fire and power-sharing agreement on Sunday and hailed a new longed-for era of peace in the country. 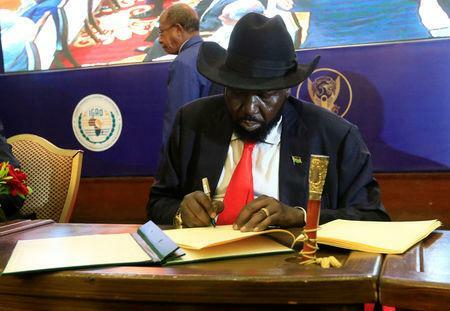 "I call on everyone as a leader of South Sudan that this agreement which we have signed today should be the end of the war and the conflict in our country," said President Salva Kiir. Sudan's president Omar al-Bashir said on Sunday oil would be pumped from South Sudan's Wahda region to Sudan beginning September 1. 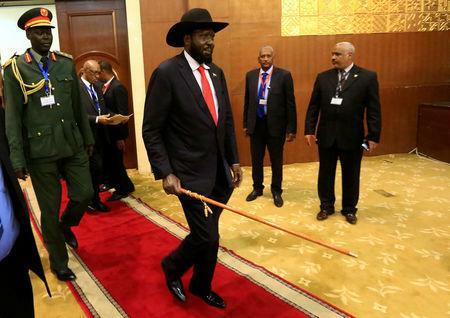 "There will be profit brother Salva ... one of our goals is the need to save the economy of South Sudan because it has reached a level of collapse," he said on Sudan State TV. Previous peace agreements held for only a matter of months before fighting resumed, which Kiir has blamed on foreign influence. "My government and I know the conflict in South Sudan has resulted in a financial and political burden," Kiir said. Machar said, "there is no option but peace ... we have to focus after this stage on implementing the agreement that if we don't implement, we will all be failures." On Friday, Kiir said he believed the new peace deal between his government and the main rebel group would not collapse because it was not forced upon them like previous accords.